Zambian authorities have released three Barotse activists, Afumba Mombotwa, Likando Pelekelo and Inambao Kalima, from prison due to pressure from the international community. These activists were arrested in December 2014 and sentenced to ten years for treason in March 2016 for attempting to repeal the 1964 Barotseland Agreement that united Barotseland and Northern Rhodesia into the Republic of Zambia. The Barotse National Freedom Alliance (BNFA) praised the work of the international community in freeing these activists and called for the fundamental human rights of the Barotse people to be upheld by the Zambian government. The Zambia Watchdog has established that international pressure forced the PF government to release the three Linyungandambo leaders, Afumba Mombotwa, Likando Pelekelo and Inambao Kalima who were ‘silently’ released from prison early this week. They were moved from Luwingu, Kasama and Mansa state prisons were they were being held respectively on Friday 4 May 2018. The three were again split and taken to three different prisons, one was dropped at Mukobeko in Kabwe, one at Mwembeshi while another one was taken to Lusaka Central Correctional facility before being finally reunited in Lusaka and released. It has also been established that their release is not connected to the recently announced pending dialogue between the government of Zambia and the Barotse Royal Establishment but was as a result of mounting pressure on Edgar Lungu’s government by the international community to release the three political prisoners. 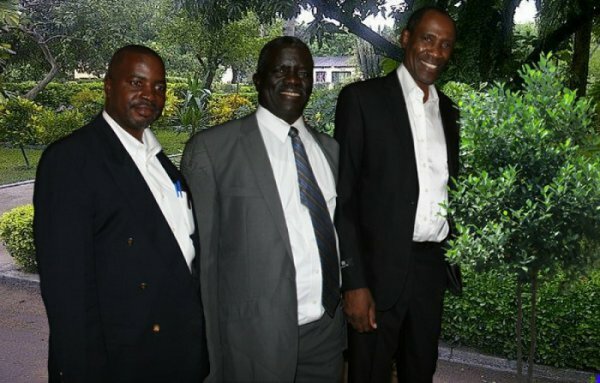 The three were sentenced to 10 year jail terms by the high court in March 2016 after being charged of treason felony for trying to implement the 2012 Barotseland National Council (BNC) resolutions under which it was resolved to accept Zambia’s unilateral abrogation of the 1964 Barotseland Agreement under which Barotseland and Northern Rhodesia merged to form the Republic of Zambia. The three had been in prison from the time they were arrested by the police on 5th December 2014 at Kasaya checkpoint in Mwandi. They were expected to arrive in Mongu on Tuesday 8 May 2018 but the programme was changed and they remain in Lusaka but are likely to travel back to Mongu on Wednesday 9 May 2018. And Barotse National Freedom Alliance (BNFA) leader Clement Sinyinda has thanked the international community for mounting pressure on the Zambian government to release the Barotse political prisoners. ‘The Barotse National Freedom Alliance (BNFA) thanks the international community and all those who responded positively to our calls to put pressure on the oppressive Zambian regime to release Barotse activists and stop denying the Barotse their fundamental human rights, including the right to assemble, the right to associate, the right to free speech, the right of movement, the right to employment and right to self-determination,’ reads part of the message posted on the BNFA official webpage.